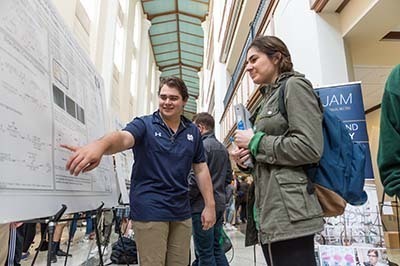 Students and faculty attend COS-JAM from all departments within the college in order to learn more about the exciting work their peers are engaged in. For the presenters, of which there were 203 student authors and 143 abstracts, the experience of sharing their research with their peers prepares them for future attendance at regional or national scientific meetings, said Dominic Chaloner, undergraduate research coordinator for the college and research associate professor in the Department of Biological Sciences. Presenting to peers at COS-JAM is a low-stakes environment for presenting work, he said. Students’ research and presentations reflected the diversity of topics being studied by faculty within the college, according to Chaloner. A similar event for graduate students and postdoctoral researchers was held May 4, 2017. 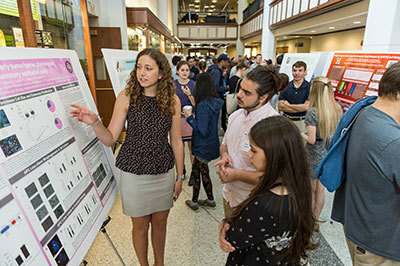 The next COS-JAM event for undergraduate researchers will be held on Friday, May 4, 2018. Originally published by Grant Johnson and Deanna Csomo McCool at science.nd.edu on June 15, 2017.